This mountain is located east of the town Niigata (located on the west coast of Honsu). There is a subsidiary peak, named Mount Iide, that is actually better known in Japan. Locate Hwy. 459 going east-west, then Hwy 383 looping north from there. A smaller (but still paved) road runs north from Hwy 383 to connect with Hwy 376, this is the closest south-north road that passes east of the mountain. That is, from Hwy. 459 locate the road fork at location N37.67892, E139.79141 (onto Hwy. 383). Leaving Hwy. 383, by forking right, continue to the tiny village at location N37.78855, E139.78634, turn left, and proceed to the local camp ground. When I was there, the bridge had collapsed and I parked just off the road, near location N37.79387, E139.77360, elevation about 550 meter. Here is a quick reference and summary of climbs in the summer of 2015. 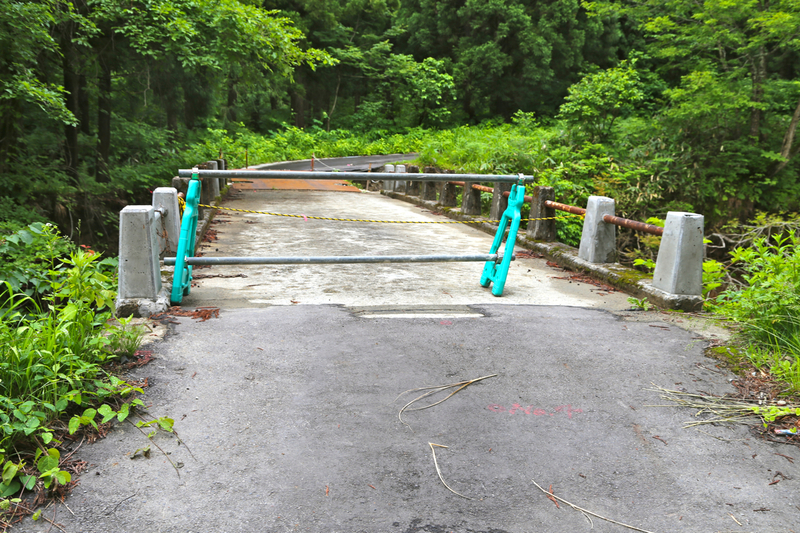 Walk up along the road (if the bridge remain collapsed), to the camp ground area. Be careful to pick the correct trail from here, do not follow the old track that follows the river. The trail goes off a bit more to the right. It quickly gains a bit of elevation in the big forest, then climbs to the crest of a ridge. The old trail more to the right, a newer trail with made steps a bit more left. As soon as the ridge is reached, the trail continues up along this ridge for quite some time. Eventually, there is a trail fork, with a trail coming from your right (this may lead to a slightly better trailhead?). Continue straight along the ridge (keep left). The next, main trail fork is signed, but only in Japanese. This is where one should turn left and head (slightly) downhill in order to connect across with a main ridge heading up towards Mount Iide. Soon, the trail runs uphill, there are short, scramble sections and the ridge is fairly narrow in a few spots. You will reach a shelter hut at about 1650 meter of elevation. Note that this is another trailfork, the perhaps most obvious trail is incorrect. The trail descends steeply on the right side as seen when arriving at the hut (sort of behind the hut to your right). The trail soon crosses the local col and resumes ascending. The next waypoint is a pretty large hut, popular for staying overnight. The trail continues uphill and reaches hut number 3 at location N37.85349, E139.71402, elevation about 2110 meter. This hut is located very close to the summit named Iide. Only a short and easy hike will get you to the top of this mountain. From here, the trail descends (make certain that you pick the correct, leftmost trail). Next, the route traverses slightly, the general trend is a fairly flat trail. You will pass mountain hut number 4. After a few smaller (local) tops, the trail makes the final saddle before ascending. The summit has a marker, but seems to be infrequently visited. There may be an alternative route to this summit, we actually tried to find this trailhead first, but decided against it as the road was closed. See a bit more information below. We first tried to access what looked like a promising trailhead, by turning north from Hwy. 459 at location N37.70918, E139.55627. This small road runs up the valley, one should keep right at a road fork higher up. We got as far as location N37.74446, E139.61903, unfortunately, the road was closed at this point. If one can drive this road to its end, there is a trail that continues up the valley, then follows a ridge that runs north to the summit. One may also consider to just walk the upper part of this road, this route may be quite direct and possibly shorter than the route we ended up doing. We turned around at the closed road around 0900, drove back down and along Hwy. 459 to the alternative road fork and continued to the tiny village where we turned left, hoping to reach the local camp ground. However, the bridge had collapsed and we parked just off the road, near this point, location N37.79387, E139.77360. We finally started walking at 1130, then immediately took the wrong path and hiked up along the river to a dam. Understanding the mistake, we returned to the campground and picked the correct trail climbing to the long ridge that would get us up to higher elevations. Unfortunately, at the second trail fork, with only japanese signs, we turned right, ie. continued uphill. This was a bad mistake. At the following trailfork, it seemed obvious that we should stay left. However, this trail descended and after loosing a lot of elevation, we realized that we had made a substantial navigational error. We climbed back up and retraced our steps all the way back to the trailfork where we should have turned left and descended. The weather took a turn for the worse, it started to rain and the wind was picking up. We were already pretty soaked as we scrambled up the ridge and arrived at the first shelter. Here, we made our third navigational error for the day. We could only see one trail and naturally followed this one. Again, descending - after a bit, we questioned the situation and decided to walk back to the hut. Upon closer examination, we then discovered the trail descending steeply at the other side. 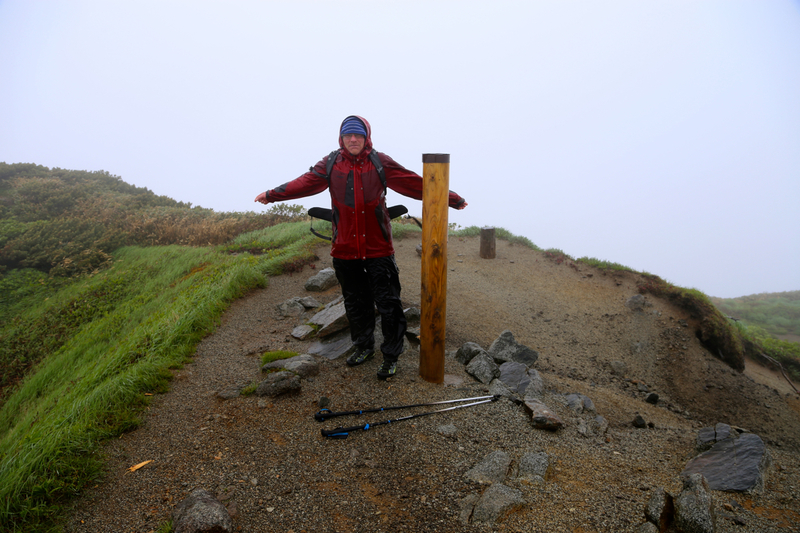 The weather continued to detoriate and the time was 1600 when we reached hut number 2, both very wet indeed. We got inside and considered the situation. Obviously, a lot of time had been lost, partly due to all errors, but also because this trail was long and time consuming. We rested and talked to some other parties. Very friendly people that also offered us some food. After a while, we still decided that it would be wise to use the time and push on to the next hut, ocated very near the summit of Mount Iide. Thus, at 1700, we left and continued uphill. The weather quickly changed from bad to horrible. The rain increased in strength and the wind gradually picked up to storm, more than 20 m/s. At one passage that required scrambling, I decided to climb a slightly more difficult route, but protected from being blown off the (sharp) ridge. We finally made the hut just before the Iide summit at 1815, what a trip this had been! Time to take off wet clothes, unfortunately, everything was wet, including all contents in my backpack. We had no food and really no gear for an overnight except for Åke's Jerven bivu-cover. We laid down in a corner of the hut, trying to conserve as much body heat as possible. Clearly, this would be a long, cold and wet night. I was pretty cold, but ok given the circumstances. Around 0200, I needed to get up, put on an extra layer of wet clothing and just walk back and forth to keep warm. We left at first light around 0430. Completely wet, but happy to move. The rain and wind still persisted. Gradually, the weather improved somewhat, still rain and wind, but not quite as bad as earlier. This kind of weather should really not happen in the month of June. We arrived at the summit at 0620, quite happy, but knowing that we had a long hike to get back to the car. 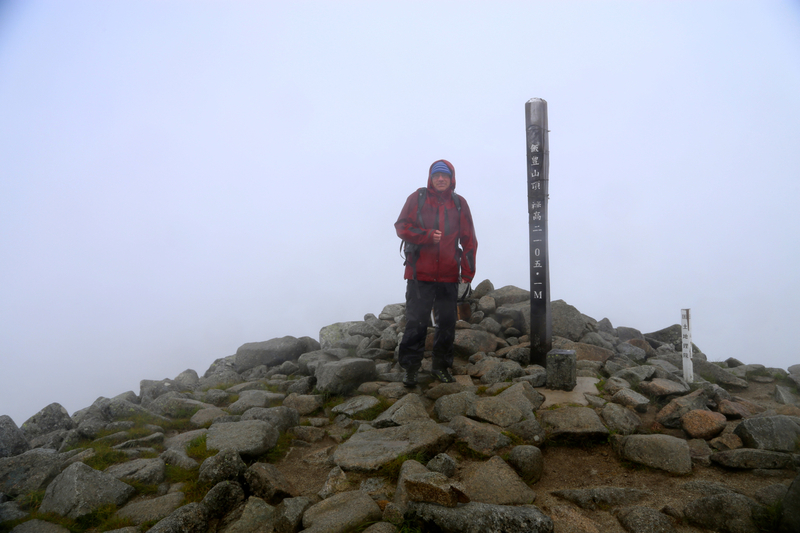 We did not stay around for long, the weather was still miserable and we were still both wet and cold. The return hike to the hut took 2 hours, We walked on further and reached the next hut after one more hour. There, we took a 20 minute break before continuing down. We were back at the car at 1330, total hiking time for the day, 9 hours. The entire climb, including time due to several navigational errors, required close to 15 hours. Thus, even under more favorable conditions and without errors, this would be a very long day.